George VI (George Rex) was king at the time. "His/Her Majesty The King/Queen, Seigneur of the Swans." Swan Upping dates from medieval times, when the Crown claimed ownership of all mute swans at a time when swans were considered an important food source for banquets and feasts. 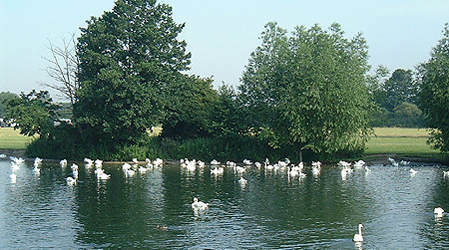 Today, the Crown retains the right to ownership of all unmarked Mute swans in open water, but the Queen only exercises her ownership on certain stretches of the River Thames and its surrounding tributaries. This ownership is shared with the Vintners' and Dyers' Companies, who were both granted rights of ownership by the Crown in the fifteenth century. Nowadays, the swans are counted and marked, but rarely eaten except perhaps occasionally at State Banquets. 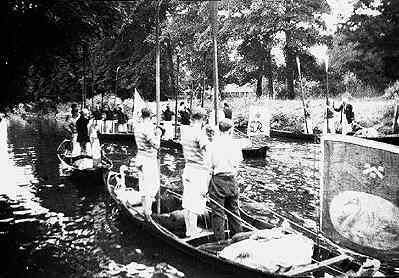 The Queen's Swan Marker and Swan Uppers, accompanied by the Swan Uppers of the Vinters' and Dyers' livery companies use six traditional Thames rowing skiffs in their five day journey upstream as far as Abingdon. 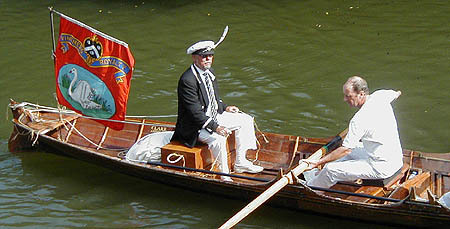 By tradition, scarlet uniforms are worn by The Queen's Swan Marker and Swan Uppers, and each boat flies their appropriate flags and pennants. In the above picture the flag flying on the right hand boat features an 'E' and 'VII' so this picture was taken during the reign of Edward VII [1901-1910]. The king's Swan Master would travel in this boat. These pictures date from around 1908 as the picture below also features the Thames Hotel, extreme right, which was constructed at about that time. The Queen's Swan Marker produces a report at the completion of Swan Upping each year, which provides data on the number of swans accounted for, including broods and cygnets. The cygnets are weighed and measured to obtain estimates of growth rates, and the birds are examined for any sign of injury (commonly caused by fishing hooks and line). The cygnets are ringed with individual identification numbers by The Queen's Swan Warden, whose role is scientific and non-ceremonial. Apart from Swan Upping, The Queen's Swan Marker has other duties: he advises local organisations throughout the country on swan welfare and incidents involving swans, he monitors the health of local swan populations, and he briefs fishing and boating organisations on how to work with existing wildlife and maintain existing natural habitats. He works closely with swan rescue organisations and carries out the rescue of sick and injured swans when relevant, and coordinates the removal of swans from stretches of the river Thames used for summer rowing regattas. Swan Upping, the annual census of the swan population on certain stretches of the River Thames, was announced today by David Barber, The Queen's Swan Marker. 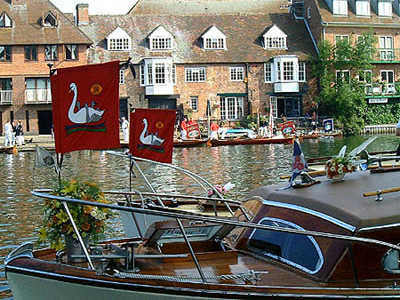 The ceremony of Swan Upping dates from the twelfth century and takes place during the third week of July each year. It has always been the duty of the Sovereign's Swan Marker to count the young cygnets each year and to ensure that the swan population is maintained. 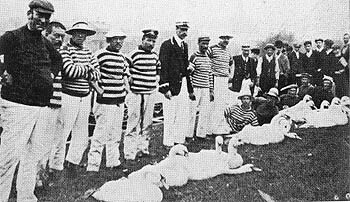 With the assistance of the Swan Warden, Professor Christopher Perrins of the University of Oxford, the swans are also given a health check. "There has been a significant increase in the number of breeding pairs nesting this year, with cygnets hatching earlier than usual. Fortunately the swans have avoided the spring floods that have washed away many nests in previous years. Vandalism has once again taken its toll on the swan population as nests have been destroyed and eggs broken. These incidents occur mainly where the swans have nested in unsuitable locations within easy reach of riverside towns. Fishing hooks and line are a significant factor in the injuries and deaths of many young cygnets. Discarded fishing tackle poses a severe threat of drowning and ingested hooks and line cause immense suffering which often results in death. The dedication and vigilance shown by swan rescue organisations, combined with the support of the public and the work of the Environment Agency, is helping to maintain swan numbers. Conservation continues to play a vital role in the ceremony of Swan Upping. It collates important data that reflects the enormous changes in the river's environment over past years, and a greater awareness of methods of conservation has resulted in a higher level of protection for the swans. Education will play an important role in Royal Swan Upping this year and several schools will be visiting the banks of the River Thames. This educational programme will give young children an insight into how to protect the welfare of the swans. Children from local schools will accompany the Swan Uppers as they carry out the swan census and health checks. They will have the opportunity to learn the history of Swan Upping and to understand the conservational impact of the ceremony today. I hope this will increase their awareness of the value of our wildlife and import a sense of the respect with which it should be treated." Local schools seeking further information should contact the Swan Marker's office on 01628-523030. A Typical Timetable for Swan Upping on the Thames. This normally takes place during the third week of July . The Vintners Company skiff. July 2000. Note the Swan feather in the cox's cap!